Back in February I bought a fantastic size 12 pink dress from Coast. 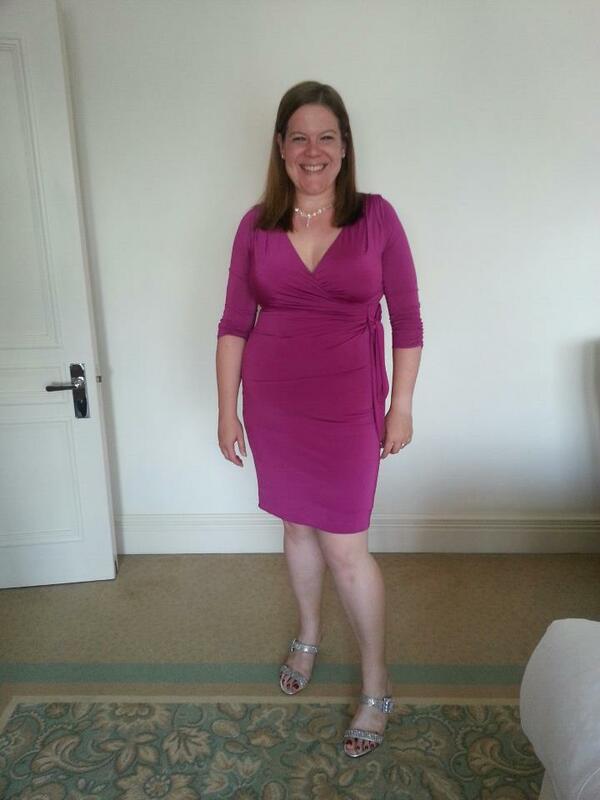 I loved the style and colour – both very me and getting into it became one of my Thinking Slimmer goals . It’s our 3rd wedding anniversary on Wednesday and we went out for dinner on Saturday night. I had decided a couple of months ago to set myself a target of being able to wear the dress out for our anniversary dinner. I have been listening to my Slimpod regularly and if you’ve followed this blog you’ll know that I’ve done Jillian Michael’s 30 Day Shred and have now progressed to her Six Week Six Pack workout in an effort to target my tummy which is my problem area. I’ve also had a bit of extra help with something that has been holding me back food wise. Dawn is a fellow Slimpodder who has recently become a qualified cognitive hypnotherapist herself. She has set up her own business – Think it Change it and is developing a range of ways to work with her clients which she calls ‘Therapy beyond Geography’ – the concept being that she can deliver therapy online, through the use of Skype or even, in certain situations over the phone. I had noticed that despite listening to my Slimpod and following all the Thinking Slimmer golden rules that now and again I was still reaching for food when I wasn’t hungry. Not all the time or anywhere near as often as I used to – the Slimpod has definitely helped with that – but just every now and again I’d find myself thinking about snacking when I wasn’t hungry. Dawn took me through a technique called EFT which involves tapping on various parts of your body. Sounds weird right, but I tell you what – it’s worked and it’s worked really quickly – my desire to eat when I’m not hungry has gone and I feel like I’m totally back on track food wise. Amazing that something so quick and simple can have such a dramatic effect and how brilliant that it can be delivered online. And I’m delighted to report that on Saturday night I was able to fit into my pink dress and wore it out for dinner for a fantastic meal with my lovely husband. I was so pleased to finally fit into the dress. I won’t lie – it could still fit better, and it will in the months to come, but the fact is that when I bought it I couldn’t even get it done up let alone think about wearing it out for dinner. So thank you Dawn, thank you Thinking Slimmer, thank you Jillian and well done me! I’ve already set my goals out for the next 8 weeks with PT Mollie’s Virtual Training Group and my focus is now switching back to my running performance for a while before I find myself another piece of clothing to aim for. Thank you, and thanks for your help. It really made a difference. You look fabulous! I absolutely love the dress on you and congratulations on your achievements! This EFT method sounds really great, by the way. Thank you Anna. The EFT was great – I have no idea how it works but it definitely did!